It's always struck me as weird that biscuits are often served as a side to main courses like fried chicken and turkey dinners. 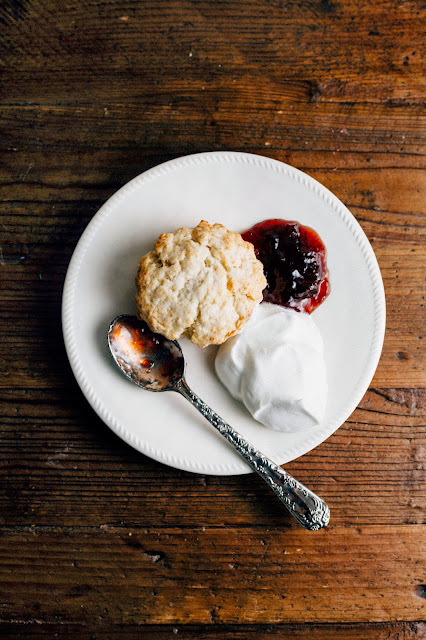 Biscuits are so good on their own that they deserve to be the star of the meal. Ironically, I haven't always been a big fan of biscuits up until recently. The first time I ever had a fully fledged, all-American biscuit was at my friend Katherine's house for Christmas. It was my sophomore year of college and her mom had put us in charge of the sides. We drove to the supermarket and picked up some potatoes and a can of frozen Pillsbury biscuit dough. I watched in fascination as Katherine unrolled the cardboard wrapping, pulled apart the frozen dough, and carelessly placed the blobs on a baking tray. Twenty minutes later, we had flat, chewy discs of dough that tasted like artificial butter. I remember thinking that I just didn't see what the fuss was all about. Later, after I graduated from college, I moved into a studio apartment just around the corner from Portland's infamous Pine State Biscuits. I spent the majority of my days frantically searching for jobs on Craigslist and furiously ignoring the delicious smells of bacon and butter that would waft through my window. They're biscuits, I thought to myself. Remember how much you hated those in high school? For a long time, I avoided the restaurant. Despite the long lines (often times out the restaurant's doors) proving otherwise, I was convinced that I wasn't missing out on anything. But one day, as I was walking home from a job interview that had gone poorly, I saw that there was no line. I looked around suspiciously to see if there was a trick that I was missing. Nope. I shrugged and figured that I might as well take advantage and see what all the fuss is about. A few minutes later, I had a biscuit the size of my palm in my hands, with little ramekins of butter and marionberry jam on the side. I took a bite. Instantly, my long-standing grudge against biscuits disappeared. The biscuit was fresh out the oven and each bite dissolved into warm, butter crumbs in my mouth. After that moment, I wanted a Pine State biscuit almost every day. Luckily, the line for a biscuit sandwich was almost always out the door, preventing me from exercising my desires and gaining an extra 100 pounds. But still — since I lived around the corner, I quickly learned when the lines would be its shortest. It was then that I would swoop in and grab myself a $3 biscuit with honey butter and marionberry jam. But because of this indulgence during my stint of unemployment, I can't help but feel a little bit guilty every time I eat a biscuit. I mean, instead of looking for a job, I was eating biscuits! Still — even though it's been years, I haven't been back to Pine State Biscuits because I'm worried I'll be reminded of the times I was a listless and unemployed 22-year-old. Despite this irrational guilt, I sometimes get nostalgic and can't fight the craving for one. In an attempt to avoid Pine State, I've tried recreating them at home. But my first attempt was no good; although they tasted great, the biscuits didn't puff and brown the way the were supposed to. 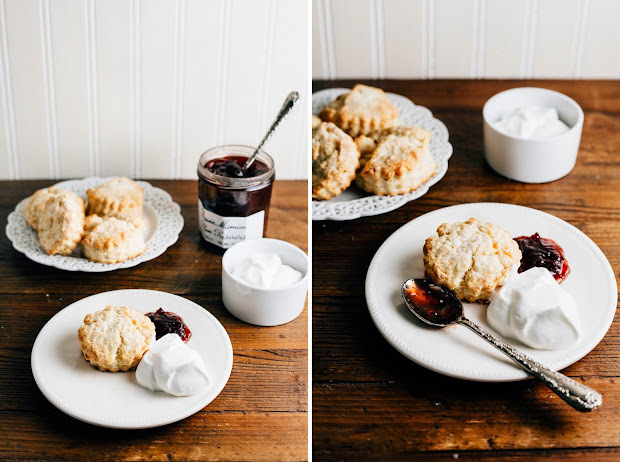 I handled the biscuits too much — the crumbly, fall-apart texture that I was trying to recreate comes from the utmost minimal handling of the dough. I used plum jam, but you can use whatever flavor you'd like. For fun, I also infused the extra cream I had left over with some of my favorite Earl Grey tea to make Earl Grey infused whipped cream. The flavor is subtle, but it gives the entire dish a little something-something extra. Overall, this recipe is perfect for an indulgent breakfast or a tea time snack. 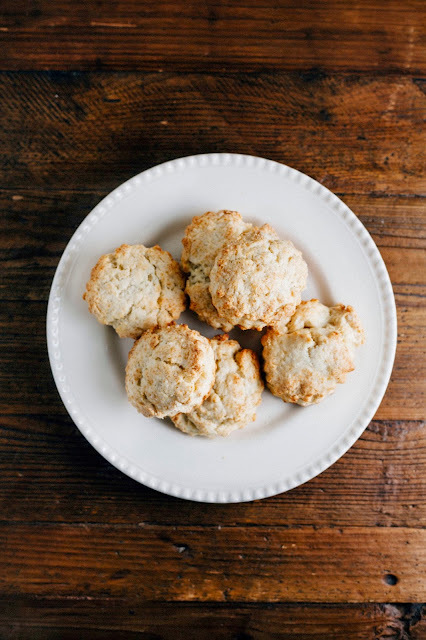 Biscuits are a type of quick bread, which are breads leavened with baking powder and/or baking soda instead of yeast. Unfortunately, that means that most quick breads have an incredibly short shelf life. These biscuits are best when eaten immediately, slightly cooled after being pulled out from the oven. They can be kept overnight in an airtight container, but they will immediately won't have the same perfectly flaky and crumbly crumb the next day. They'll probably also taste a little bit stale the next day, so please, please, please eat them fresh! The key to a perfectly tender biscuit with the perfect crumb is to handle the dough as little as possible. I cannot stress this enough! When making biscuits, it's best to err on the side of an underkneaded dough than an overkneaded one. Knead and roll out your dough to the point where it's still very loose and there are still pieces crumbling off. It may seem insane when you're cutting out the biscuits, but the loose dough puffs up in the heat, giving the biscuits a perfectly rustic misshapen form. 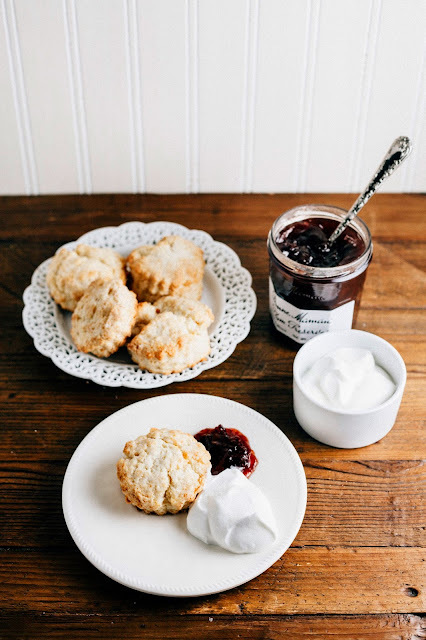 If you're making these for breakfast, a best practice is to get up a little early to dump the tea into some cream to infuse it with flavor, and go back to bed. Wake up a few hours later and make the biscuits. 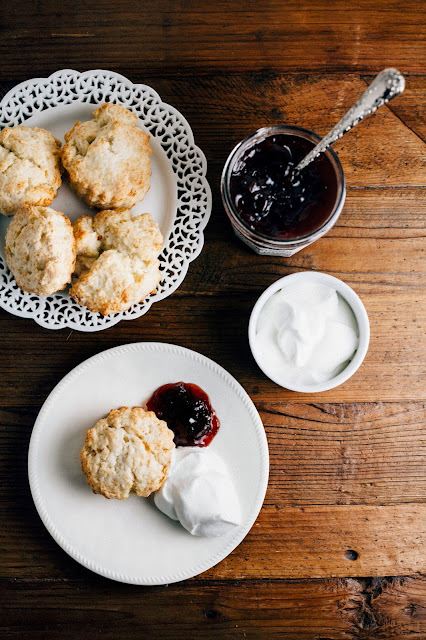 When the biscuits are ready, whip up the cream and serve. If that sounds a little too labor intensive, you can always just skip the infused cream and use regular whipped cream. I also didn't add any sugar to the Earl Grey whipped cream because the jam I was using was pretty sweet, so feel free to throw a teaspoon or two of confectioner's sugar to the recipe if you're looking for something a little bit sweeter. Center a rack in the oven and preheat the oven to 425 (F). Prepare a baking sheet by lining with parchment paper or a Silpat mat. In a medium bowl, gently whisk together 2 cups all-purpose flour, 1 tablespoon baking powder, 2 teaspoons granulated sugar, and 1/2 teaspoon salt until well combined. Pour about 1 cup of the cream over the dry ingredients, and use a fork to start tossing the ingredients together. If necessary, add more cream a spoonful at a time until you've got a nice, soft dough. Reach into the bowl with your hands and give the dough a quick, gentle kneading — 3 or 4 turns should be just enough to bring everything together. DO NOT OVERKNEAD. Turn out the dough onto a lightly floured work surface. Quickly and lightly pat the dough with your hands until it is about 1/2 inch high. Don't worry if the dough isn't completely even — a quick, light touch is more important than accuracy. You don't want to overhandle the dough. Use a 2-inch biscuit cutter to cut out as many biscuits as you can. Try to cut the biscuits as close to one another as you can so you can get the most biscuits from this round. Transfer the biscuits to the baking sheet, leaving about 1 1/2 inches between each biscuit. Gather the scraps (but try and work them as little as possible) and repeat the patting together and cutting out process. Once you've got all the biscuits you can get, use a pastry brush to brush the tops of each biscuit with the leftover 1 tablespoon of cream. Bake in the preheated oven for 16 to 18 minutes until the biscuits are tall, puffed, and golden brown. Transfer to a wire rack to let cool slightly before serving immediately. In a liquid measuring cup, combine 1 cup heavy cream and 1 tablespoon loose-leaf Earl Grey tea. Gently whisk before covering with plastic wrap and letting sit in the fridge for at least 1 hour, but preferably 2. Once the tea has infused into the cream, use a fine mesh sieve to strain out the tea leaves and strain the cream into a medium bowl. Discard the leaves. Use a handheld electric whisk to beat the cream on medium-high speed until soft peaks form. If using confectioner's sugar, add them to the cream before beating. Use immediately. I remember making those Pillsbury biscuits with Emily, hah. The dough was so soft, I kept petting it. It is totally unheard of in lil ol' New Zealand to have biscuits with mains... I can't imagine it... it must be kind of like having bread on the side I guess. This might be something I have to experience myself. Do you have the sweet biscuits with savoury mains? Yeah, it's a pretty American thing I think? It's good for mopping up sides and sauces like gravy. These biscuits aren't actually that sweet — there's only a couple of teaspoons of granulated sugar in the recipe. I had some leftover biscuits with some sunny side up eggs and they went well together. The recipe is flexible enough to go with both sweet and savory accompaniments. I didn't love biscuits when I was younger, either...the canned ones scarred me! Now I love them and love making them. So easy and satisfying! I recently moved to Portland and had my first Pine State Biscuits experience last weekend...so good! 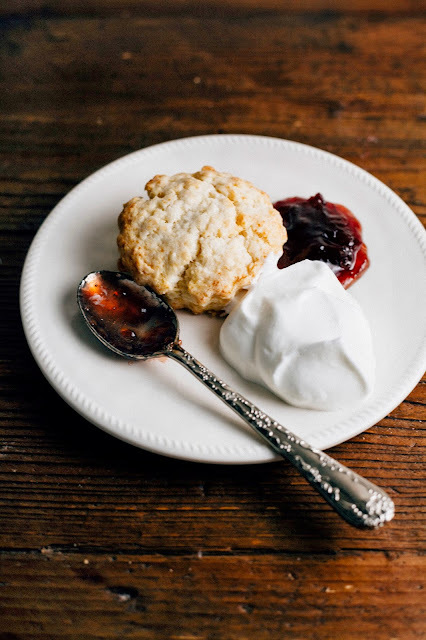 Biscuits are just one of the most comforting foods - steamy, fluffy, tender, great for topping with savory or sweet combinations - what is not to like, really? Yours look divine. Loving the Earl Grey tea infused cream idea - how creative! You had me at "Earl Grey whipped cream". I don't know if I would've survived living so close to a bakery like that. Man! Biscuits are so good...I've always loved them. 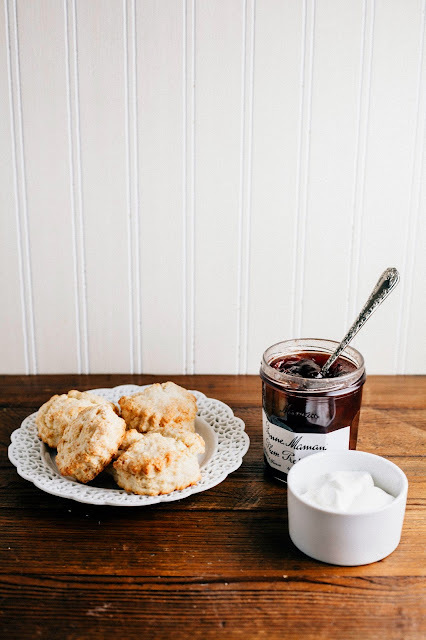 There's a place right around the corner from us that makes the sweetest, butteriest biscuits on earth-- pretty much dessert in my opinion as delightful as they taste. And I would be just fine eating them solely for a meal-- they are that good all by themselves. Earl Grey whipped cream -- oh my god, I LOVE it. (Will I ever meet a tea-infused thing I don't immediately crave with all my being?) Also, I'm obsessed with the idea of using cream instead of butter and milk. I've only made biscuits the other way -- I'll have to try this next time. I've just started making biscuits, the first time was with butter, will try your recipe without, looks amazing! Been to pine state biscuits once when we were in Portland. Oh man they were good! midd of article i feel it yami ..